The Domino Sugar Refinery is one of the last major industrial sites on Williamsburg's waterfront. Recently, the entire site was acquired by CPC Resources and Isaac Katan, with the intention of redeveloping the site for residential use (with up to 1,500 units proposed). WPA supports the redevelopment of the site, provided that architecturally and historically significant buildings such as the refinery, Adant House and Power House are preserved as part of the redevelopment. We believe that a comprehensive preservation program, combined with high-quality new design and affordable housing will best serve the Williamsburg community. Read on for a summary of the history and significance of the Domino site. The Domino Sugar Refinery is among the most significant waterfront industrial sites in New York City. Soon, the Domino site will be rezoned for residential use. The Waterfront Preservation Alliance believes that the historic buildings at the Domino site should be preserved and adapted for residential or other uses. Domino is a wonderful opportunity for historic preservation, new development and affordable housing to work together to create a better New York. 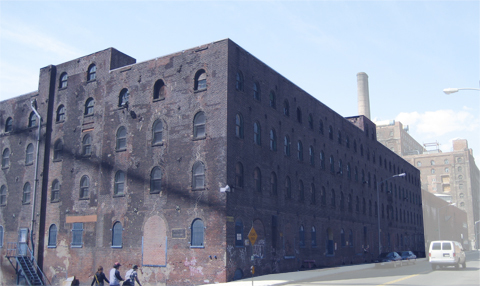 Please show your support for the preservation of the historic Domino refinery buildings by signing our online petition to designate Domino as an official New York City Landmarks. While we had noticed this a week or two ago, we were just reminded by one of our far-flung correspondents of the large number of recently opened windows at the Domino Sugar Refinery. Now this building has stood solidly in its place for almost 125 years, so we can only hope that a few weeks of exposure to the elements will not do any damage. Still, it raises questions of what the developers are doing with this important historic resource, and why they are there are suddenly dozens of windows left open during the coldest part of the year. Seriously, in addition to the potential for damage to the structure caused by exposure, freezing pipes and freezing and thawing masonry, such neglect invites vandals and explorers. 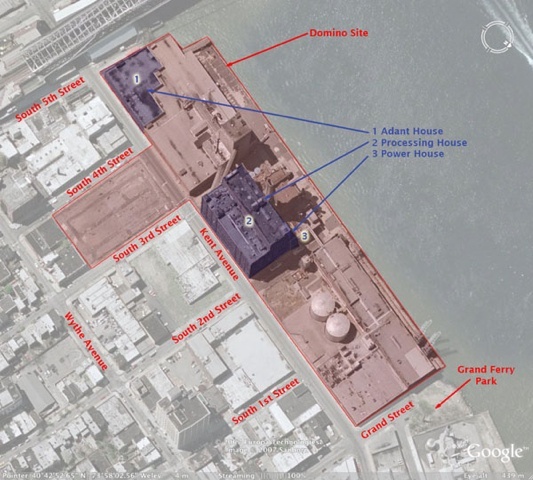 Hopefully, the Landmarks Preservation Commission will do the right thing and designate the refinery as a landmark (you can encourage them to do the right thing by signing our petition). Until then, please, close those windows. Domino Sugar, main refinery building. The Waterfront Preservation Alliance of Greenpoint & Williamsburg has submitted over 1,500 signatures requesting that the Landmarks Preservation Commission hold hearings to designate the Domino Sugar refinery building and Adant house as City Landmarks. These signatures came from online petitions, street petitions and postcard campaigns launched by WPA over the past few months, and show a broad base of support for the preservation of this important part of Williamsburg's industrial heritage. Over 90% of the supporters of designation are New York City residents, and two thirds of the supporters are Brooklyn residents. More than one in ten supporters live on Williamsburg's Southside, and thus are Domino's neighbors. Almost a third of the supporters live in the North Brooklyn neighborhoods of Williamsburg, Greenpoint and Bushwick. The 1,525 names do not include the hundreds of postcards and emails that have been directly to Landmarks Chair Robert Tierney. 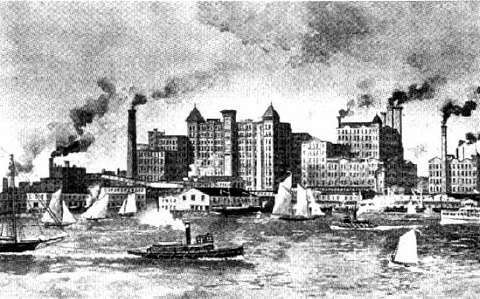 In 1852, Havemeyers & Elder opened the first sugar refinery on the Brooklyn waterfront. Within 20 years, they were joined by at least a dozen other refineries, as sugar became one of Williamsburg's predominant industries. The original Havemeyers refinery was destroyed by fire in 1882, and in 1883 the current refinery building, power house and Adant (sugar cube) house were constructed. 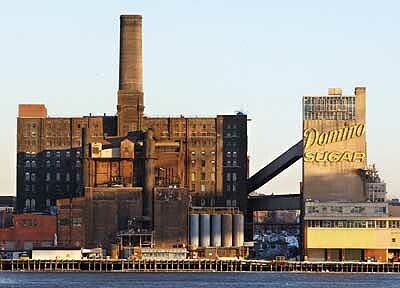 The site continued to operate as a sugar refinery until 2004, when Domino closed down their Brooklyn operations. The site has since been sold to a consortium that includes CPC Resources (the for-profit arm of the Community Preservation Corporation) and Brooklyn developer Isaac Katan. To date, the new developers have not committed to any preservation on the site. WPA believes that these three surviving 19th century structures are an important part of Williamsburg's industrial history. These architecturally distinguished buildings, which make up less than a quarter of the seven-block Domino development site, should be designated as New York City landmarks and incorporated into the future development plans for the site. The main refinery is 12-stories tall, and the Adant house is four stories tall. Both buildings have had stories removed - stories that could be reinstated as part of a Landmarks-approved rehabilitation. In submitting the petitions, WPA spokesperson Alice Rich said "the response to our petitions shows that there is very strong support within the community for a redevelopment project that includes historic preservation. WPA has tried very hard to work with the developer to put together a project that does exactly that, but to date we have not seen any plans. The Landmarks Commission has been looking at this site for well over a year, and we think it is time for the Commission to act." 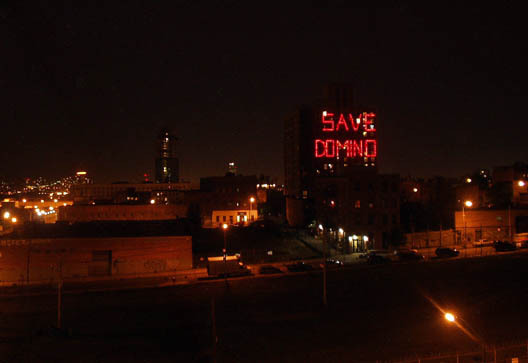 The Domino site was part of the Preservation League of New York State's "7 to Save" endangered list of 2006. In addition to the Preservation League, designation is supported by the Municipal Art Society and Historic Districts Council. 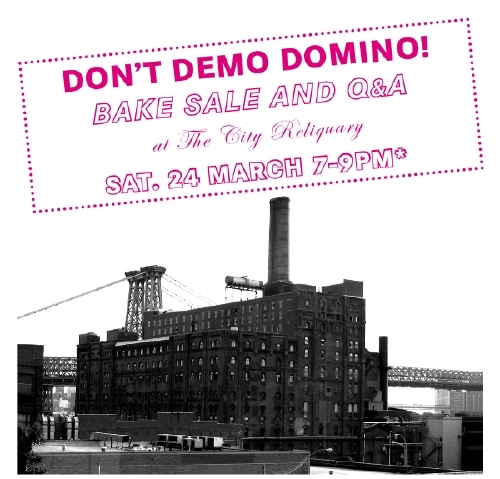 The Waterfront Preservation Alliance of Greenpoint and Williamsburg and the City Reliquary are co-sponsoring a "Dont Demo Domino Bake Sale and Q & A" on Saturday, March 24th from 7-9pm at the City Reliquary, 370 Metropolitan Avenue in Williamsburg. The perfect opportunity to eat baked treats made with Brooklyn’s own Domino Sugar, AND LEARN SOMETHING NEW ABOUT YOUR NEIGHBORHOOD!!! Members of the Waterfront Preservation Alliance of Greenpoint & Williamsburg will give informal yet informative talks on the history and the future of the Domino Sugar Factory, and answer community questions. The amazing collection of the City Reliquary will be on view free of charge! Baked goods and drinks will be available for purchase at affordable prices. Proceeds to benefi t the City Reliquary and the Waterfront Preservation Alliance. Domino Sugar Factory: The Greenpoint-Williamsburg may have been a sweet deal for housing along the waterfront, but it does have its sticking points, including the preservation of a historic building in the neighborhood. Built in 1884 and shuttered in 2004, the Domino Sugar factory remains an icon in Williamsburg for its illuminated curlicue sign. But because of its historical significance, the building has spawned a housing battle as its current owner, CPC Resources, determines how to turn the former factory into a residential development. While some advocates want CPC Resources to build the maximum amount of affordable housing, others want the developer to preserve the factory as much as possible. "We're trying to develop something that's responsible in terms of affordable housing and in terms of preservation," said Richard Edmonds, a spokesman for the CPC Resources, a subsidiary of Community Preservation Corp., an affordable housing developer. Edmonds said the developer will unveil its plans in the coming weeks. However, he did say that more than 20% of the development's units will be affordable housing. The Waterfront Preservation Alliance of Greenpoint & Williamsburg is pleased to announce that for the second time in as many months, the New York City Landmarks Preservation Commission has calendared a significant north Brooklyn industrial site for designation as a New York City Landmark. 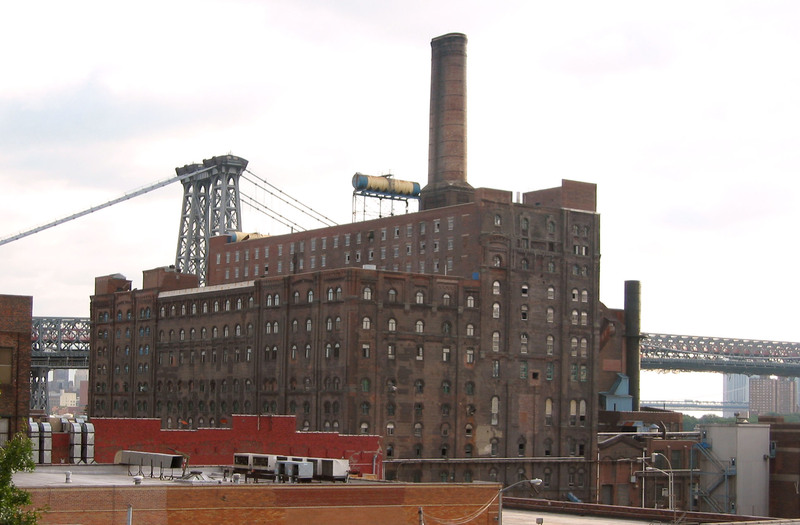 This morning, LPC voted unanimously to designate consider for designation the processing house of the Domino Sugar refinery in Williamsburg Brooklyn. The processing house, which dates to 1883, is an icon of the Brooklyn waterfront. The structure housed three separate sugar refining operations in one vertically-integrated factory: the Filter House; the Pan House; and the Finishing House. The full operation of the plant is described in WPA's nomination to LPC, located here. The designation calendaring of the Domino Refinery comes after a petition and postcard campaign coordinated by WPA and the Municipal Art Society. Thousands of neighborhood and city residents have written to LPC in support of this designation. WPA spokesperson Alice Rich, noting that this action is an important first step towards landmarking Domino, stated "landmarking means that the rich history of Williamsburg's past has a place in its future. Landmarking says that these buildings are significant and should be retained no matter what the future use of the site may be." 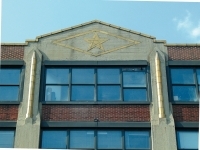 The calendaring focuses on only one building three buildings* in a six-block site located on either side of Kent Avenue between Grand Street and the Williamsburg Bridge. While much of the remainder of the site consists of more recent structures of lesser architectural value, the calendaring omits the Adant House at South 5th Street, an 1883 building in which sugar cubes were manufactured, and a smaller 1883 power house located adjacent to the processing plant. WPA has advocated for the preservation of these two structures, and will continue to do so. The designation of the processing plant would also free the remainder of the site from any meaningful design review, a situation which WPA has opposed. The processing plant was constructed in 1883 after a catastrophic fire destroyed the original 1854 Havemeyers & Elder refinery. The 1883 refinery was at one point the largest sugar refinery in the world. The Domino Refinery was active until 2004, when the plant was shut down and its operations moved to Yonkers, NY. It remains one of the largest industrial buildings on Brooklyn's once-thriving East River waterfront. After the plant closed, the property was acquired by the CPC Resources, a subsidiary of the Community Preservation Corporation. CPCR is expected to file soon to have the property rezoned for residential use. 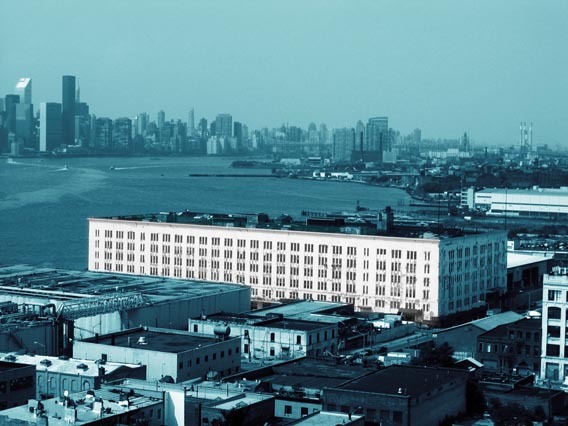 Last month, LPC voted to calendar the Eberhard Faber Pencil Factory in Greenpoint for a designation hearing. In addition to MAS and the Historic Districts Council, the designation of the Domino refinery has also been supported by Councilmember David Yassky, who informed WPA that he wrote to LPC in September, 2006 in support of designation. *UPDATE: As noted in the comments, there is some confusion about exactly what and how many buildings are up for designation. The building being considered is the Processing House, shown in photos 1 and 3 in this post. The processing house is actually three separate structures: the Filter House, which is the 12-story portion nearest the river; the Pan House which is the northern 2/3 of the 10-story portion along Kent Avenue; and the Pan House, which is the southern 1/3 of the 10-story portion along Kent Avenue. We have always referred to this conglomeration, which includes the large smokestack but nothing to the west of it, as one building. Landmarks has taken to calling this three buildings, which is fine. By that math, though, there are five buildings on the Domino site that were constructed in 1883, and Landmarks is only considering three of these. WPA continues to believe that the remaining two buildings, the Adant House (photo 2, above) and the Power House are significant, and that both could be preserved and incorporated into a reuse of the site. But mostly, we're excited that the Processing House (or the Filter, Finishing and Pan Houses) is (are) finally up for Landmark consideration. Clear enough? (Actually, it should be clearer if you look at our โบนัส 100 % กีฬาsite plan in our Domino history post.) UPDATE #2: We were imprecise in some of our wording above; LPC has calendared the Processing House. That means that sometime in the (near) future, LPC will hold a public hearing at which the Commissioners will consider whether or not to designate the structure. Calendaring is the first step in the process, but Domino is by no means a City landmark (yet). The residents of the Esquire Building have gotten into the act with a Domino Sugar sign of their own. The west side of the main refinery building. The 1882 Havemeyers & Elder sign is at the base of the historic chimney; the oval stack above was added in the 1930s. Community Preservation Corporation, the developer, has said that it supports the preservation and reuse of this structure. If this building is retained, and the buildings to west are removed, this historic west facade will be visible from the East River. A group of photobloggers managed to get into the Domino refinery and document the interior of the building. There are some amazing pictures here, particularly for the industrial archaeologists among us. Most of these are interior shots, and don't show the architectural features of the most historic buildings. But they do give a great sense of the scale of the operation. And they are amazing. There's also a great panorama from the roof of the Bin Structure (!) here. And, Gothamist has a post on it as well. 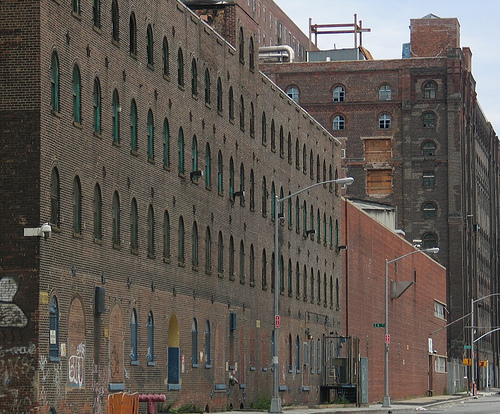 Just one day after the National Trust put Brooklyn's industrial heritage on its 11 Endangered List, some more good news. 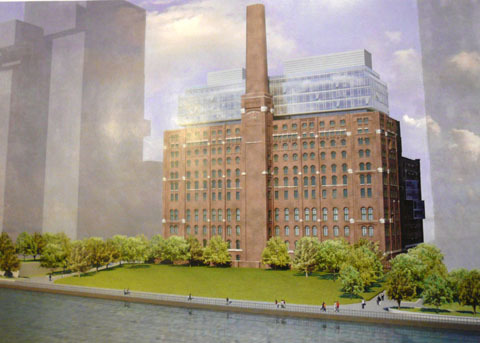 Landmarks has announced that the public hearing for the Domino Sugar Refinery designation will take place on Tuesday, 26 June 2007. The announcement says that the hearing will start at 9:30, but that may or not be the exact time for the Domino portion of the hearing. Stay tuned, and plan to attend. 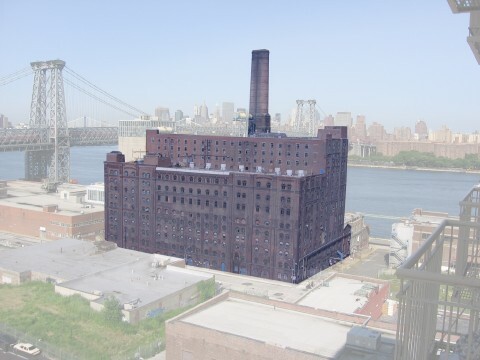 The Landmarks Commission has confirmed that they will hold the first public hearing for the designation of the Domino Sugar Processing House next Tuesday, 26 June, at 9:45. Those wishing to testify in support of designation will need to fill out a speaker's form at the Commission's hearing room. If you cannot attend the hearing to testify, we encourage you to submit a letter of support. The Landmarks Commission is located at 1 Centre Street, 9th Floor North. That's the Municipal Building, which is at the eastern terminus of Chambers Street. The Brooklyn Bridge station of the 4/5/6 and the Chambers Street station of the J/M/Z are underneath the building; the City Hall station of the R/W is about a block away. There is a security check to get into the building, so bring a valid ID and leave the sharp objects at home. And plan to arrive a few minutes early. The Landmarks Preservation Commission held its first hearing on the Domino designation this morning. The hearing was held before a packed room of onlookers and speakers, and lasted just over an hour or so. So as not to bury the lede: no one spoke against the designation of the main Domino refinery building. Just about everyone favored the proposed designation, although some (like WPA) thought that LPC could go a little bit further. After a presentation by LPC on the history of the refinery building and the site, the owner of the property, Community Preservation Corporation, was the first to speak. As they have in other venues, CPC spoke in favor of the refinery building. Michael Lappin, the chair of CPC, stated that their mission was primarily to build housing, but that CPC believes that the site is significant and that they can (with some considerable effort) adapt the refinery for new uses. Lappin was followed by Robert Silman, a noted structural engineer who has worked on numerous historic properties. Silman noted the structural challenges of adapting a building that has very few floors and a structural system that is actually underbuilt. Frank Sciami of Sciami Construction also spoke on behalf of CPC, and described the construction challenges that confront them in converting the building. Sam Rockwell, representing Councilmember David Yassky, also testified in favor of the designation. Yassky noted that this should be a first step in the preservation of more of Brooklyn's - and the city's - waterfront. A representative from the Pratt Center for Community Development gave very strong testimony not only favor of this designation but supporting preservation as an important part of community building in general. Pratt singled out the loss of the Dutch Mustard building and other industrial buildings as evidence of the problem, and denounced the practice of many in real estate market of pitting preservation against affordable housing. Their statement closed with a call for the city to establish a broader framework that would support both affordable housing and preservation as complementary goals. Others speaking in favor designation were the New York Landmarks Conservancy ("enthusiastically supports"); the Society for Industrial Archaeology; the Historic Districts Council; the Society for the Architecture of the City; the Municipal Art Society; the Metropolitan Chapter of the Victorian Society of America; WPA (of course); and the North Brooklyn Alliance. All of these groups supported the designation, but also supported the idea of designating more than just one building. SIA raised the issue of former Domino buildings that are not part of this development site, something we thought was very important, and so far overlooked. The only non-positive voice was that of Churches United, who testified (more or less) that they would be OK with preservation, so long as it didn't cut into the currently proposed number of affordable housing units (600+ in CPC's latest plan). One member of CU suggested that LPC base its decision to designate solely on the affordable housing question - an interesting proposition, given that that is not what LPC is empowered to do. Still, the bottom line for Churches United seems to be that do not support designation, but they do not oppose it either. With Domino in the news in a big way now, there is a lot of confusion about what is what. Almost two years ago, WPA prepared a detailed description of the Domino site and its history, which you can see here. For a little orientation, we are reprinting here the map we first published in that earlier piece. The Landmarks Commission has proposed to designate the Processing House, which is the main building in the complex. Dating to 1883, and designed by Theodore A. Havemeyer, the Processing House contains three separate functions - in reality, three separate buildings. 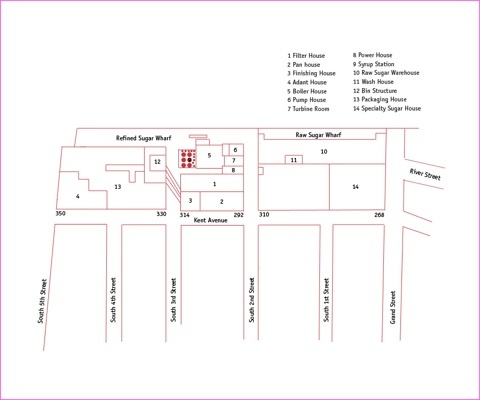 These are the Filter House (#1 on the map, above), where the sugar cane was processed into a syrup; the Pan House (#2), where the syrup was distilled into powder form; and the Finishing House (#3), where the sugar was graded and prepared for packaging. In addition to the Processing House, there are two other structures that date to 1883, and were also designed by Theodore A. Havemeyer. These are the Adant House (#4), at the corner of South 6th and Kent Avenue, where sugar was processed into cubes (Gustav Adant patented an early process for manufacturing sugar cubes); and the Power House (#8), a two-story structure immediately west of the Processing House. WPA is asking that the Landmarks Commission look at these two buildings in addition to the main Processing House. Community Preservation Corporation, the owner and developer of the site, has said quite clearly that they support the designation of the Processing House, but nothing more. While WPA appreciates CPC's position, we believe that both the Adant House and the Power House could be preserved and incorporated into CPC's overall plans for the site without impacting the developer's stated goals of providing housing, affordable housing and open space. Quite the contrary, WPA believes that incorporating these buildings into the design would enhance the overall project. If there is one thing that everyone (or at least everyone at Tuesday's Landmarks hearing) seems to agree on, it is that the Domino Sugar Processing House should be a New York City Landmark. Preservationists, neighborhood activists, the developer and affordable housing activists all agreed that this complex of three buildings was worthy of designation. Highlighted in the photo above, the Processing House is really a complex of three buildings serving three separate functions. The western portion of the building, 12 stories tall, is the Filter House. 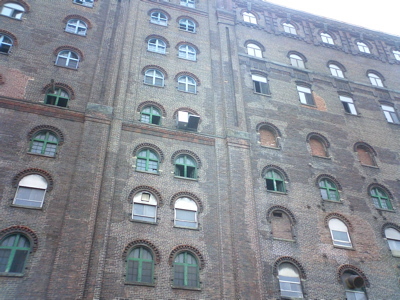 The eastern portion of the building, 10 stories tall, contains the Pan House and the Finishing House. It was within this one building, er complex, constructed in 1883, that raw sugar cane was converted into powdered sugar - at the rate of 3 million pounds a day. The Processing House is certainly the most architecturally distinguished building on the site, with its round arch window openings and distinctive brick corbeling at the window heads and cornices. Although largely obscured by later buildings to the west (river side), the base of the original chimney stack is still visible (there are some fantastic photos here). The tall oval smoke stack was a later addition, constructed in the early 1930s. The top of the Processing House has been altered over time. The Filter House originally included a pair of pyramidal-roof towers at the north and south end of the building. These were demolished in the 1950s, and the existing east wall of the Filter House - which almost looks like an addition - was constructed. The decorative parapets of the Pan and Finishing House along Kent Avenue were also demolished at about this time. 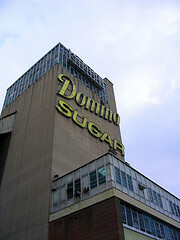 The original Domino Sugars sign was located on top of this building - it appears that it was removed in 1961 or so, when the existing sign was installed on the Bin Structure. The Adant House, which sits at the corner of South 5th and Kent, is one of the buildings that WPA has Landmarks to add to its designation. The building was constructed as part of the 1883 rebuilding of the Havemeyers & Elder Sugar Refinery, and was used for processing sugar into cubes (in a process patented by Gustav Adant in the late-19th century). The Adant House was originally 6 stories tall, with a penthouse at the seventh story, and was topped by the corbelled and pedimented parapets that were a hallmark of the original refinery design. In the 1950s, Domino cut the building down to four stories. Except for the decorative parapets, the design of this building was much more utilitarian than that of the main refinery. However, we feel that this building, together with the main refinery, form a complex of 19th century factory structures that better tell the story of the sugar refining process, and better tell the story of the sheer scale and dominance of the Havemeyers sugar refining operations. The building also relates very directly to the industrial buildings immediately across Kent Avenue (which are now condos). The property's owner, CPC Resources, has argued that preserving this building would not fit in with its development plans. WPA strongly disagrees - the CPC plan calls for a building of roughly 6 to 8 stories at this location. The Landmarks Commission would surely approve an addition to this building to bring it back to its well-documented historic height. So in essence, CPC is proposing to take down a building and replace with an almost identical height building. That is the Dutch Mustard scenario all over again - instead of a more interesting design that melds old and new, simply tear down the old and replace it with something far less interesting. Saving this building would enhance the overall design of the project, be more responsible from an environmental point of view, and would not impact the ability of the project to provide retail, affordable housing, or luxury housing. This building even has larger window openings than the main refinery. In short, saving the Adant House could easily fit in with the development plans, rather than thwarting them. Even if LPC refuses to add this structure to the designation, WPA hopes that CPC will see the benefits of keeping the Adant House in some form or another. The last piece of the Domino puzzle is the Power House, a tiny building, but a significant one, in that it dates to 1883 (when the entire site was rebuilt). It was thus part of a complex of industrial buildings that became the world's most efficient and prolific sugar making machine. The 1883 Power House replaced an older Havemeyers power house that still stands on South 4th Street. The new (1883) Power House is a tiny building that sits nestled amongst a number of later, larger infrastructure buildings - in fact, it often confused with the much larger Boiler House (ca. 1930), the six-story gambrel roof building that blocks much of the view of the Processing House from the river side. At two stories and less that 25' wide, the Power House is easily missed, yet it matches the architectural expression of the adjacent Processing House. In fact, the Power House retains its original corbelled and pedimented brick parapet, a design detail that has been stripped from the Processing House and the Adant House. The ground floor of the Power House has been completely obliterated - replaced by a flat brick facade with a garage entry. Yet the building still retains significance for its decorative brick work and its functional and architectural role in the overall refinery complex. At the recent LPC hearing, the Commission's research staff noted that the plans for the new refinery were developed at least a year or two prior to the 1882 fire that destroyed the old Havemeyers refinery. It is certainly possible, then, that the Power House (and the Adant House) were not just ad hoc parts of a larger refinery complex, but carefully considered parts of a whole. Like the other buildings in the refinery complex that WPA has been advocating for, the Power House is clearly architecturally and functionally consistent with the 1883 Havemeyers & Elder sugar refinery. And like the other buildings that WPA is advocating for, the Power House could easily be a contributing building within a residential redevelopment along the lines of that which CPC is putting forward. The Power House occupies a part of the project that is slated for open space. While preservation of this building would reduce the amount of public open space in the project, the building itself is small enough that it could serve to enhance this planned open space. It could function as a concession area, or remain as a partial ruin (a smaller version of the Tobacco Warehouse in Dumbo's Empire-Fulton Ferry state park). Certainly its retention would not be a significant economic burden, and nor would its retention take away from any planned affordable (or non-affordable) housing in the project. 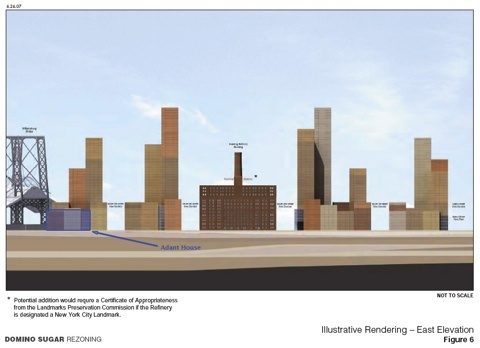 As reported on Curbed yesterday, the Department of City Planning has released scoping documents for the Domino Sugar Refinery redevelopment. The document is the public's first look at the proposed height, density and massing of the project, as well as the various community benefits such as preservation, affordable housing and open space. And although the plans are still very schematic, the document clearly supports WPA's position regarding the Adant House and the Power House. In both cases, these very historic structures could be incorporated into the design without compromising bulk, density or housing units (affordable or otherwise), and with only minimal impact on the proposed public open space. The plan as proposed now would leave the refinery as a relic of the past, completely unintegrated into the new development. 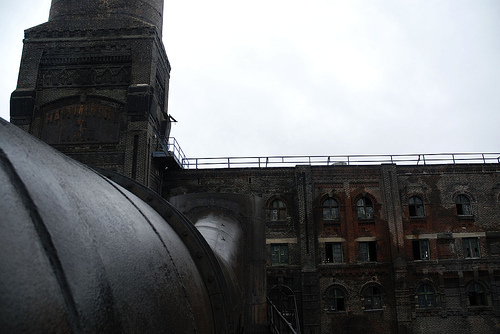 The alternative, one which WPA has consistently advocated, is to retain more of the 19th-century refinery complex and weave these historic elements into the 21st-century residential development. The approximate location of the Adant House is outlined in blue. The scoping document describes the project as a series of towers, with the tallest at 40 stories (2 towers), the next tallest at 30 stories (2 more towers), and the rest between 6 and 20 stories. The scoping document does not provide exact sizes for the smaller towers, but the Kent Avenue elevation (above) makes it pretty clear that the Adant House will be demolished to make way for - get this - a six to eight story apartment building. You may remember from a previous post that the Adant House now stands at four stories. Historically, though, the Adant House was six stories along Kent Avenue with a set-back seventh story. If LPC designated the Adant House the developer would have ample precedent for expanding the current building back to its historic six stories plus penthouse. The portion of the new development that would be affected averages out to about 7 stories. So the argument that preservation of the Adant House would take away from housing units (or affordable housing units) is completely without merit. 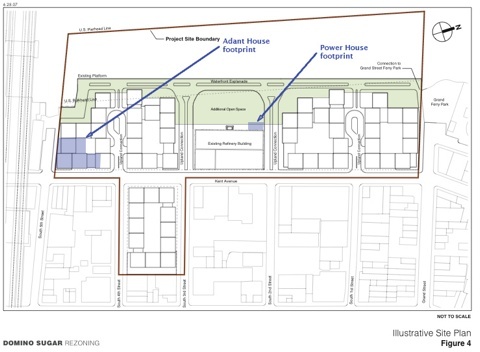 As for the Power House, this narrow building sits partially within the footprint of the "additional open space" shown on the scoping site plan (see below). Clearly, preserving this building would have no impact on housing, affordable or otherwise. And it would have only limited impact on the provision of open space. Assuming the whole building has a footprint of 2,500 square feet (a generous assumption), the portion of the building that sits within the public open space is probably less than 1,300 square feet. Further, because the Power House and Refinery were built at the same time, it is possible that the Power House is either structurally or design-wise integral to the Refinery itself. In other words, if you demolish this small two-story structure, what's left of the Refinery behind it? The approximate location of the Adant House and Power House are outlined in blue. WPA continues to believe that the preservation of the Adant House and Power House makes eminent sense from a preservation point of view. We also believe that it makes sense from a public policy point of view, from an urban design point of view, and from a housing and development point of view. In short, we feel that weaving these 19th-century industrial buildings into a 21st-century residential development will make the Domino redevelopment a better project overall. The rebuilt Havemeyers & Elder's sugar refinery in the 1880s, reconstructed after the devastating 1882 fire. Francis Morrone discusses the history of sugar refining in New York and the fight to preserve the Domino Sugar Refinery in Thursday's Observer. An interesting point that we had not considered before: with the closing of the Domino refinery in 2004, 2005 was the first time in 275 years that sugar was not produced in New York City (dating back to the founding of William Bayard's refinery in 1730). 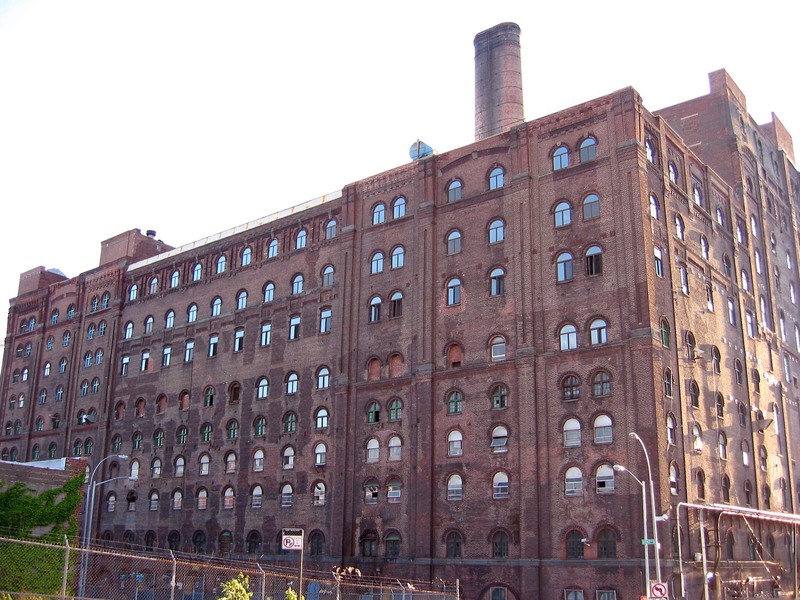 WPA is pleased to announce that the Landmarks Preservation Commission has designated the main refinery building of the Domino Sugar refinery a landmark. Once again, the Landmarks Commission has shown tremendous resolve in recognizing the importance of Brooklyn's industrial heritage. The Mayor's office also deserves praise for recognizing that Williamsburg's industrial past deserves has a place in its bright new future. The designation of the refinery is great news. It is something that WPA, its members and its supporters have worked very hard to make happen. We are excited that the Domino Sugar Refinery will actually be a part of the New Domino, and not just another branding opportunity. If you've been following along, you know that the designation does not include a number of other significant buildings on the Domino site that WPA and others have advocated for. It is unfortunate that the Landmarks Commissioners never had an opportunity to review the other buildings on the site. Despite the developer's claims to the contrary, the remainder of the site has been determined historically significant and eligible for the National Register of Historic Places. WPA will continue to work for more preservation at the site, and in particular for preservation that we feel is compatible with the larger community goals for the site, including affordable housing and open space. We welcome the opportunity to work with the developer as a consulting party on the ongoing public review of the project. The designation of the Domino refinery is still subject to the approval of the City Council (and we know what can happen there). So until then, we will leave our question mark in place. "Domino really became a symbol to us," said local activist Mikki Halpin, who organized a benefit concert over the summer to raise money to preserve the complex. "It would be great if we could save this one little piece of waterfront, have one place where the paint is still peeling." "What drew people originally to the area was the human scale of the neighborhood," said industrial archeologist Mary Habstritt. "It is nothing like what the developers are planning." And GowanusLounge has a very spot-on analysis of what it all means (and, significantly, what it doesn't mean). 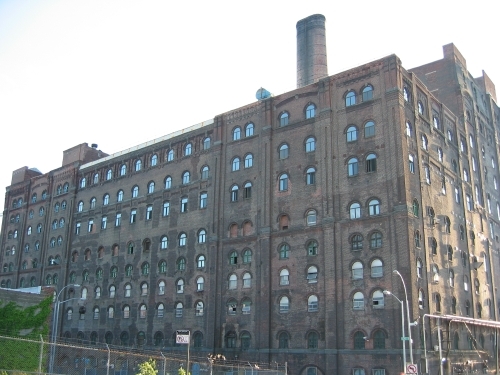 With the designation of the Domino Sugar Refinery Processing House, the Landmarks Commission has proven once again that it gets industrial heritage. Sure, they could have gotten a lot more, but its worth highlighting the fact that this is the fourth major industrial site in North Brooklyn to be designated in the past few years. And to the great chagrin of the beauty pageant promoters who believe that landmarking is only about "pretty" buildings, not all of these buildings are pretty. But they are all significant, locally and to the city (some are nationally significant). Add to that the recent calendaring of DUMBO, and LPC Chair Robert Tierney is right to tout his commission's role in designating industrial properties. There may be other Hecla, Domino and Eberhard buildings that are not landmarks and should be, but lets give credit where its due. Landmarks has also been busy with some of North Brooklyn's non-industrial sites of late. Witness the designation of the Williamsburg Houses (2003), the original Smith-Gray Building [pdf link] (2005), and the McCarren Park Pool (2007). And lest Mr. Tierney rest on his laurels, we will point out that there are a lot more highly significant (dare we say beautiful) industrial buildings out there to designate. Not to mention a host of other buildings in our (until recently) neglected corner of Brooklyn. And Williamsburg is still without a single historic district (hopefully not for long). Worth a read: the Landmarks Preservation Commission has posted its designation report (pdf!) for the Pan, Filter and Processing House. The report is a much more in-depth study of the Havemeyers & Elder Refinery than our own report (prepared over two years ago). LPC's report includes a discussion of the architectural, industrial and social significance of the refinery, and includes a number of pieces of information that we were not able to discover. The photo above, which WPA first featured this past June, made the report. This past Tuesday, Community Preservation Corporation Resources (CPCR) and its team made their first formal presentation on the "New Domino" plan to the community at large. The forum was a special land use committee meeting of Community Board 1 at the Swinging 60s Senior Center on Ainslie Street. CPCR (the lead developer), it architects, landscape architect and attorney gave a 45 minute presentation, which was followed by about an hour of Q&A from the community. The project is largely unchanged from what was presented to community groups over the summer, so there was little in the way of new news. In terms of preservation, there was little in the way of content overall. CPCR is, of course, preserving the refinery (they mentioned on more than one occasion that they supported the designation of the refinery). The development plans still call for the removal of all of the other Domino buildings on the site, including the Adant House. Although the project's preservation architect (Beyer Blinder Belle) was there and made a presentation, they did not have any details on the proposed addition to the refinery. Even the program for the refinery remains vague - there will be one story of retail, two stories (100,000 sf) of community facility, and the remainder market-rate residential (and to be fair, CPCR said at the outset that a lot of aspects of their proposal were still under development). 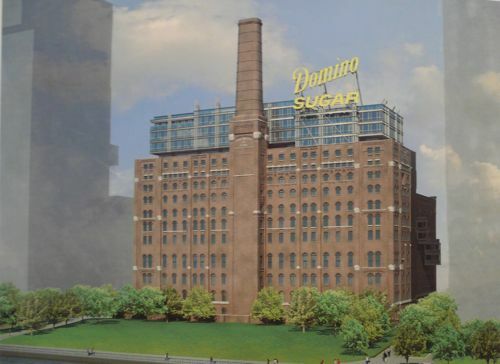 The one piece of actual preservation news is that CPCR more or less committed to retaining the Domino Sugar sign and incorporating it "somewhere" within the project. Most of the Q&A focused on questions of building heights and the overall project density, with the most impassioned comments reserved for CPCR's plans for the former Domino parking on the east side of Kent Avenue. There, the developer is proposing to build to a density of 6.0 FAR, with buildings up to 14 stories tall. This height and density far exceeds anything approved for non-waterfront blocks in the larger Greenpoint-Williamsburg Rezoning (typically, the higher-density inland blocks were rezoned for a density of 3.0 FAR and a maximum building height of 7 stories). CPCR cited the neighborhood context as supporting this height and density, but that context amounts to pointing to the Esquire Building, until the recent building boom, the tallest building in all of North Brooklyn, and easily three times the height of the average building in the Southside. The timeline for the project is also a work in progress. CPCR expects their application to rezone the six Domino blocks from manufacturing to residential to be certified in January 2008. If that schedule holds, the Community Board will hold hearings on the application in January or February, and final approval of the rezoning could come as early as July 2008. In the meantime, CPCR agreed to return for a follow-up informational meeting with the community. Hopefully that will include more details on the preservation and reuse of the refinery. Time to remove that question mark - with its vote yesterday, the City Council has officially designated the main refinery of the Domino sugar factory a New York City Landmark! 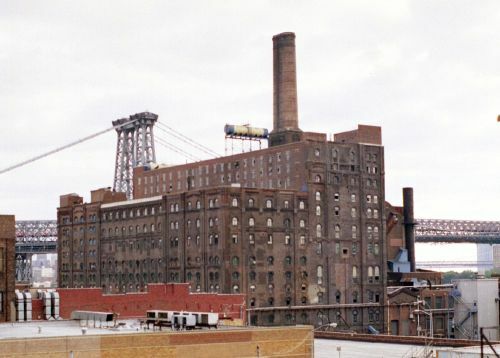 Describing New York as "a place where residential buildings abut what have been manufacturing and where manufacturing buildings can transform into new residential buildings in our city," Quinn said preserving the sugar refinery would contribute to sustaining the city's intricate and novel urban landscape. There is a lot more to the proposal. And it will all be presented to Community Board #1's Landmarks Committee on January 31st, at 6:30 PM. The meeting will be held at the Board's offices at 435 Graham Avenue (corner of Frost Street). The Landmarks Commission hearing for this proposal is scheduled for February 5th. Community Board #1's Landmarks Committee will meet at the Board's District Office, 435 Graham Avenue, Brooklyn, NY 11211 (Corner of Frost Street) on Thursday, January 31 at 6:30pm. AGENDA: · Presentation on plans for the landmarking of the Refinery, part of the Domino Project - by Ms. Susan Pollock, Project Director/Community Preservation Corporation and Mr. Michael Wetstone, Architect/Beyer Blinder & Belle. WGPA members are encouraged to attend to review the project. The project material will also be available for public viewing on Friday, 1 February, at the the Landmarks Preservation Commission offices, 1 Centre Street, 9th Floor North, Manhattan starting at 9am. "292-314 Kent Avenue - Havemeyers & Elder Filter, Pan & Finishing House, later known as the American Sugar Refining Company and the Domino Sugar Refinery-Individual Landmark. Three American round-arch style industrial buildings, designed by Theodore A. Havemeyer and others and built in 1881-1884. Application is to construct rooftop and rear additions, modify and create masonry openings; and install bulkheads, mechanical equipment, windows, ground floor infill, signage, a canopy and awnings." Public testimony will be heard after the applicant has made their presentation. For those who could not make it to the Community Board last night, this is what you missed. CPCR, the lead developer of the Domino project, has hired Beyer Blinder Belle architects to design the refinery rehabilitation. Once rehabbed, the refinery will contain parking at the basement level, 30,000 sf of retail at the ground floor, community facilities at the second and third floors, and residential above. Because the refinery is now a landmark, most of the proposed changes are subject to a public review at the Landmarks Preservation Commission. The public hearing for this application will take place on Tuesday, February 5 at 2:00 p.m., at the Municipal Building (1 Centre Street), 9th Floor North. A quick update from this afternoon's LPC public hearing (the short answer being that no action was taken). After a long presentation and even longer public testimony, the Commissioners asked questions and made some comments, but agreed to reconvene in the next few weeks for a formal commentary. The comments that we did hear from the Commissioners made it clear that none of the Commissioners are ready to stand up and support a five-story rooftop addition on the refinery. Some Commissioners seemed to be comfortable with an addition of two or possibly three stories, assuming that such an addition was more architecturally integrated with the historic refinery and the rest of the new development (very close to WGPA's position). The Commissioners who spoke also did not seem to like the storefront design (again, WGPA's position). Public testimony was generally split along two lines - those who felt that the proposal was appropriate because affordable housing was paramount, and those that felt that the proposed plan was not appropriate because it did not meet basic preservation standards. WGPA falls into the latter category, but as we noted in our testimony, the affordable housing issue is a red herring. The project does not need the rooftop addition in order to succeed; even if LPC finds some (or all) of the addition to be inappropriate, the developers can reallocate that floor area within the 11.5 acre project site (there are dozens of small towers on the site, and the lost floor area from the refinery could easily be reallocated there). So this will be back at LPC soon, at which time the latest chapter (but hopefully not the whole story) will be finished. Stay tuned. The Landmarks Preservation Commission finally held part 2 of the Domino hearing this morning. Community Preservation Corporation reiterated its case, that this addition was necessary for the lofty goals of the overall project. Beyer Blinder Belle, architect for the addition, compared their design to not only the Tate Modern, but also the Morgan Library and the Hearst Tower. Even Rafael Viñoly was there in person to make the case for the overall project. Councilmember Diana Reyna gave the only public testimony, in favor of the large addition. And then the Commissioners had their say. As for the rest of the project, the Commissioners largely echoed WGPA's comments there too. They liked the concept of the windows on the south wall echoing the conveyor bridges, but thought the current solution was also too tame. The storefronts and ground floor entries were called "unconsidered" - a position we also wholly agree with. In the end, no vote was taken. CPC was asked to go back to the drawing board and take the comments into account. Given that some of the comments were at cross purposes, they have a job cut out for themselves. In the end, though, the Commissioners did the right thing - Williamsburg deserves a better design that what CPC has brought forward to date. We look forward to seeing more. Economic downturns have a history of delaying, and sometimes killing, large construction projects in New York. The reports about the potential demise of Bruce Ratner's Atlantic Yards project should serve as a cautionary tale for North Brooklyn. We too have been promised much, but little has been delivered. Yet still developers flock to Williamsburg and Greenpoint promising us the moon. Nicolai Ouroussoff is right when he says that the public trust has been betrayed. Brooklyn was promised an architectural tour-de-force in Frank Gehry's design. And whether you like the overall Atlantic Yards plan or not, if only the arena gets built, we are getting ripped off culturally (and financially - WPA member Michael D. D. White has more on that here). The proposed Domino development would be the second largest residential development project in the borough, behind only Atlantic Yards. Given the scale of the project and the tremors coursing through the credit markets, it is not unreasonable to ask the developers two very fundamental questions: 1) Do you have the resources to build it? and 2) What guarantees do we have that you will build it as you say it will? Perhaps we need to resurrect an old cold war adage - trust, but verify? This is an old article, but the tensions it highlights have not gone away. What it describes is a two-front war, the likes of which we have already seen here in Williamsburg and will no doubt continue to see. On the one hand, as we all know, it is a struggle to get the Landmarks Commission to recognize buildings that are significant for non-traditional reasons. This includes buildings of significance to minority communities (the focus of the article), but it also includes less "loved" buildings, such as industrial buildings, Modernist buildings, or workers' housing (to name but a few). In the 10 years since this article was written, LPC has done much better in recognizing architectural and cultural diversity, but still has a ways to go. Clearly, we all have a lot more work to do. Rendering of proposed Domino redevelopment. Source: Viñoly Architects, via Brooklyn Papers. Assemblyman Joe Lentol is not convinced that developer Community Preservation Corporation Resources needs all the zoning it is asking for at the Domino site. Lentol wants CPCR to open its books and make the case for the huge upzoning it is requesting from the City. So far, CPCR has resisted calls from community activists for greater transparency, saying, in effect, trust us. According to Lentol's office, one factor in the assemblyman's call for more information was the recent DOB filing by CPCR to construct a hotel in the Refinery building. CPCR is claiming that there are no plans for a hotel. At the most recent Community Board 1 meeting, a CPCR spokesperson claimed that the hotel filing was a "typo". Starting today and running through August 30th, the Brooklyn Public Library will feature an exhibition of photographs by Nathan Kensinger called "Twilight on the Waterfront: Brooklyn's Vanishing Industrial Heritage." In the exhibit, Kensinger documents off-limits industrial sites along Brooklyn's waterfront, shedding light on what Brooklyn has lost to development over the last five years. Kensinger's work has included documentation of Domino Sugar and the Greenpoint Terminal Market. The Library is hosting an opening night meet-the-photographer reception starting at 7:30 this evening. Brownstoner has a blow-by-blow description of the Landmarks Commission's follow up hearing on the proposed Domino Refinery building redesign, and based on the images he has posted, the results are impressive. The glass addition has been scaled back some, but more importantly, it has been redesigned to have a less sleek, more integrated appearance. In other words, it no longer appears as an afterthought plopped down on the Refinery, but now reads as part of the rehabilitation of the refinery itself. It also helps that the ridiculous bulkheads on top of the addition are now gone. Of course the other piece of big news is that the Domino sign is saved, and will be installed on top of the new addition (on the lower portion). This is good news for the sign, and an appropriate gesture given that historically, there was a large illuminated sign on top of the Refinery. Some of the other details are less clear from the initial posts. The new storefronts at the base of the building were completely out of place in the old design, and have apparently been redesigned, but we haven't seen the details. The chutes on the south side of the building seem to have grown larger and crazier, but we'll withhold judgement until we see better images. And the new window openings and windows still seem rather trite and banal, but we'd like to see more information on this too. We also note that CPC has finally put a price tag on the preservation of the refinery - an addition $40 million to the overall project cost. Its not clear if this means $40 million above and beyond what it would have cost to demolish the refinery and build something new on the site, but this number in and of itself certainly doesn't seem to justify the massive increase in density CPC is looking for on the overall project. 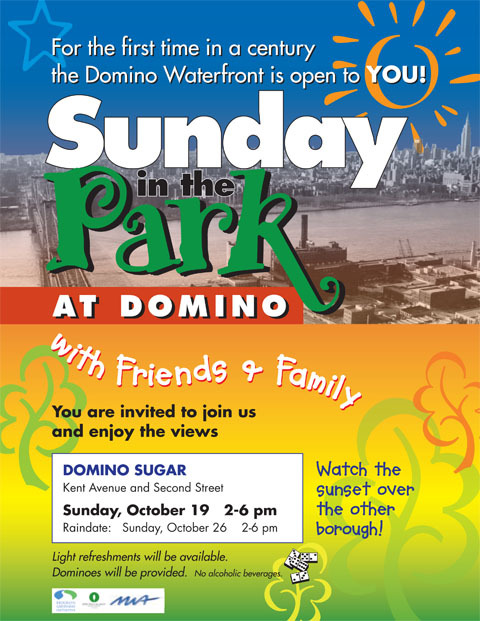 This Sunday, Domino developer CPC is opening the gates and allowing the public onto the wharf (the future esplanade). Free, and open to the public. This weblog is licensed under a โบนัส 100 % กีฬา.